The survey has now closed. Its two winters were remarkably well supported! After the second winter, the total number of WTS visits made had passed 24,500, made by almost 2,000 observers at 4,080 different locations across the UK. In all, the survey recorded more than 875,000 thrushes and nearly 634,000 other birds, including over half a million Starlings. The data are currently being cleaned in preparation for a full analysis beginning later this year. Some provisional results from the first winter are already available on the Results tab. This winter, please use BirdTrackinstead to record all your sightings of winter thrushes, and other birds. The second winter of Winter Thrushes Survey fieldwork, running from mid September 2013 to mid April 2014 has now closed. The database will remain open for at least six weeks to allow final data entry to be completed and any last-minute corrections made. If you have not yet drawn your route or polygon, this period gives you the final chance to complete your data in this way. New visits may still be entered to the database but it is unlikely that any visits made after mid April will be included in the survey's results. Final data analysis will not begin until the database has been closed. The core survey period ran from 27 December 2013 to 10 January 2014 and was well supported by volunteers - thank you! During December, 18,904 Blackbirds, 41,962 Fieldfare and 28,797 Redwing were logged on walks. It's been a mild winter in many areas so far, so it will be interesting to what happens in the second half of the winter. We encourage regular visits to squares through to mid-April. WTS enters its second winter season this weekend. The overall aim is to look again at thrush numbers, feeding locations and food through the winter (mid September to mid April) by collating observations from volunteers at locations throughout the UK. The survey methods are almost unchanged from last winter. The only substantial change is that the survey will cover just thrushes, Starlings and Waxwings this time: we no longer offer the option of recording 'additional species' such as gulls and Sparrowhawks but suggest these are entered to BirdTrack instead - ideally as part of complete lists. We warmly welcome observers new to WTS this winter and those who contributed in 2012/13. If you are returning to the survey, please look again at the methods page to refresh your knowledge of the survey. There are no important changes to the survey but there is some extra information (in bold). The instructions and field sheets have been slightly revised but any stocks of last winter's field sheets may be used this winter. If you are continuing with a square you mapped last winter, it is important, please, that you walk the same routes as before. If circumstances demand substantial changes to a route already established, please contact winter.thrushes [at] bto.org to discuss options. Any changes you make to their maps will apply retrospectively to the 2012/13 data as well – thus it is not too late to draw or correct routes or polygons for the 2012/13 season. Over the next few months, the survey's Regional Organisers will be matching observers to a small sample of randomly selected 'core squares' where a midwinter visit is requested. Please make sure your BTO Regional Rep knows if you are available for the core survey, and contribute to it if you can! WTS has now received data from over 1,600 volunteers who carried out counts in the survey's first winter, between September 2012 and April 2013. More than 3,300 different locations were covered and more than 12,600 visits were made overall. Although coverage in England was highest, with more than 2,400 sites visited, we were pleased that more than 400 sites in Scotland, over 300 in Wales and over 100 in Northern Ireland were also counted for the survey. What a fantastic effort! We are very grateful to everybody concerned. The 'core survey' aimed to collect data from randomly selected sites in a co-ordinated midwinter count. These data will be used to produce a provisional estimate of numbers. While there may yet be counts still to reach the online database, we know that more than 1,400 sites were covered for the core survey between the set dates. Far and away the best contribution came from Sussex, where 65 core visits were made. The Birmingham & West Midlands region scored 31 and eight regions are to be congratulated on covering 20 or more squares: Berkshire, Buckinghamshire, Co Down, Fife, Hampshire, Norfolk Northeast, Yorkshire (Richmond) and Yorkshire (York). Smaller totals are no less impressive in regions with few observers or with rough terrain. Analyses are all still at the exploratory stage. Katrina Sharps, who has been leading on modelling the results of feeding behaviour and food, comments as follows. "So the overall story at the moment is that there is a clear decline in the proportion of birds feeding in trees as the autumn progresses, with a similar relationship for all of the main thrush species. However, the timing of the switch between food sources such as berries in trees and ground feeding seems to differ slightly between species, and is affected by other factors which need to investigated in more detail." If there are still any unsubmitted data, including any zero counts that can be documented, we would be pleased to have them as soon as possible, either on paper or directly into the database through the online system. The survey extends well into the period of spring passage but will close for this winter in mid April, with 14 April being the last day for which WTS walks should be submitted. The survey will start again in mid September for a second winter. Over the summer we'll be looking at what we've learnt from the survey and whether to make any adjustments to survey procedure. Many thanks to everyone who has helped make WTS such a success this year. We hope we can count on your support again in 2013/14! The period for 'synchronised' counting in WTS randomly selected (core) squares closed on schedule on 10 Jan. This winter's survey has another three months to run, though, with regular surveys welcome on any squares, whether core or self-selected. New volunteers and new squares will be welcome throughout the rest of the survey period. We are really grateful to all survey contributors for the strong support the survey has received. To date, around 1,500 volunteers have entered data to the online database for more than 8,000 surveys at more than 3,000 sites across the UK. Records of more than 511,000 birds have been received. We know already that more than 1,275 core surveys were completed within the set period. Online input is not ideal for all WTS contributors and we are also receiving WTS data on paper, for input by survey organisers. If you would prefer to send your data online but are meeting problems we may be able to help with, or have questions about submitting on paper, please contact us at winter.thrushes [at] bto.org. The graph shows the total numbers of thrushes and Starlings reported to the survey each month since the survey started in mid September. It charts the progress of the survey rather than changes in bird abundance. The figures for January are just for the first half of the month, but are already high because of the extra visits made during the core midwinter period. Please help us keep the numbers high throughout the remaining three months of the survey! The period for 'synchronised' counting in WTS randomly selected (core) squares runs from today (27 Dec) until 10 Jan 2013, inclusive. If you have signed up for one or more core squares, please aim to make at least one WTS visit there during this period. To anticipate possible adverse weather later on, and especially if you have been assigned to several squares, please aim to begin fieldwork in the first-available slot of suitable thrush-watching weather. It is possible (but most unlikely) that bad weather will drive us to extend the core period: if in doubt about this, please watch this space in case of further announcements! If you will not be able to complete the core visit at a random square you are signed up for, by 10 Jan, please deselect the square as soon as possible, so that someone else may be encouraged to take it on. You can only deselect squares for which you have not yet submitted any data: just click the dustbin icon next to it on your WTS 'Data home' page. All queries, please, to your BTO Regional Rep or to winter.thrushes [at] bto.org. Please have fun and enjoy the midwinter fieldwork! Many thanks for your help with WTS core surveys – the most important part of the Winter Thrushes Survey! We continue to encourage observers to sign up for core squares if they can offer help over the survey's midwinter period (27 Dec to 10 Jan). The 'Choose a square' page has been updated and now includes a view of core squares across the UK that are still awaiting an observer. Also, it is now possible to choose a square by typing in a one-km square reference, as well as the previous method of double-clicking on the required square. Sadly, whereas the site is working perfectly on browsers such as Mozilla Firefox and Google Chrome, neither of these new features is working for users accessing the page via Internet Explorer. The problem will be resolved as soon as possible. Meanwhile, in case of difficulty in choosing a new site, please contact winter.thrushes [at] bto.org with the square you want and we will assign it to you: you should then meet no problems with the rest of the survey pages. There is now the facility to view summarised data from the WTS. Select a region to see the squares that have been chosen by observers and, for those squares already visited, drill down to a table of visits and species totals. This new tool enables volunteer observers and survey organisers to see how the survey is progressing in their region. Winter Thrushes Survey now has a series of video tutorials available, if you require help in using the survey's online pages. The first two of these, posted today, cover (1) logging in and choosing a site and (2) mapping and editing your route. They will shortly be joined by other tutorials covering drawing polygons, and entering/editing data. PS: Video tutorials (3) mapping and editing a survey area and (4) entering and editing your data were posted later the same day! All four are available on the video tutorials link. The Winter Thrushes Survey instructions ask observers to record one or more polygons around their survey route, to define the limits of the area searched. The primary purpose of the polygons is to provide a figure for survey area that, in conjunction with the bird data from the same route, can be used to estimate density (eg in birds/hectare). Within the last ten days, the mapper within the WTS program has been updated to include error messages for 'invalid polygons'. This was necessary because it has emerged that we cannot calculate a realistic area figure from many of the polygons that have been entered. You may well find that creating or editing your polygon now generates this error message – but this is of no concern for the present. The most likely reasons will be that there are small areas of overlap along the edges of the polygon, or two polygons that overlap. Any such overlaps will confuse the all-important calculation of area for your survey, when these figures are needed at the end of the winter. New guidance for drawing valid polygons will shortly be available on this web page. Important general advice is to keep the shape relatively simple and bear in mind its primary purpose as a measure of survey area. It is also important to note that there is no urgency to complete your polygons now. Despite some teething problems with online data recording and a slow arrival of thrushes from the Continent in most parts of the country, the response of volunteers to the Winter Thrushes Survey has been phenomenal! Numbers of thrushes and Starlings reported to the Winter Thrushes Survey by week (week 37 begins 10 Sep). Data for week 44 exclude the weekend. These totals indicate that the survey is on track to meet its aims of providing new data on thrush distribution, habitat use and food through the winter period. The following analysis of last winter's BirdTrack 'Focus on winter thrushes' helped us to plan the Winter Thrushes Survey. Follow links on our Resources page to see current BirdTrack results week by week during the arrival period. As part of preparations for the Winter Thrushes Survey, BirdTrack observers were invited to record extra information for their Redwing and Fieldfare observations in winter 2011/12 – in particular, on habitat the birds were using, their feeding behaviour and the foods taken. Options were open, so that observers were free to describe in their own words where the birds were and what they were doing. The analysis of these data has been very informative for the planning of the Winter Thrushes Survey, telling us about the ecology of the birds and about how observers tend to classify their habitat and behaviour. In all, there were 3,410 records of Redwings and Fieldfares submitted to BirdTrack that winter that gave information for at least one of the requested topics. We began by grouping and coding the information, taking the wording provided by the observers as our cue. Smaller categories were combined to form the short lists accompanying the pie diagrams below. This process fed in to the recording categories for the Winter Thrushes Survey, although a more comprehensive set of options is available for the new survey. The BirdTrack results give us a useful first comparison of habitat and food for Redwings and Fieldfares. Units for the pie charts are the numbers of records, irrespective of the count of birds associated with each record. Because of the relatively small sample, we have not attempted to show any changes that might occur through the winter period. Also, we have not assessed the effects of biases in the data – in effect assuming that the biases are similar for the two species. The conclusions from this survey must be tentative but it has been a valuable forerunner to the Winter Thrushes Survey. 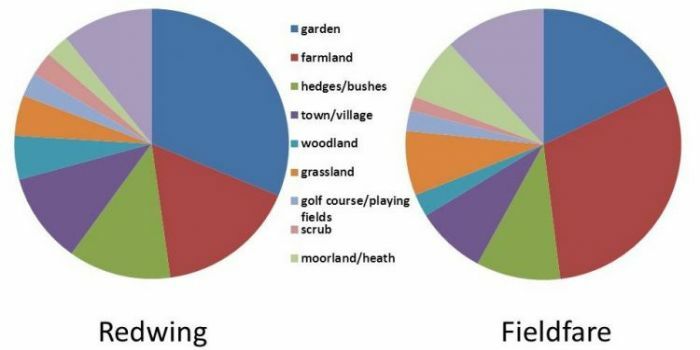 Redwings emerged as much more a bird of gardens than Fieldfare (31% v 18% of records), which was recorded much more often than Redwings on farmland (30% v 17%). The final category (other) comprised wetlands, upland pastures, railways, roads, parkland and seashore. Around 2% of records for both species specifically mentioned ash trees. 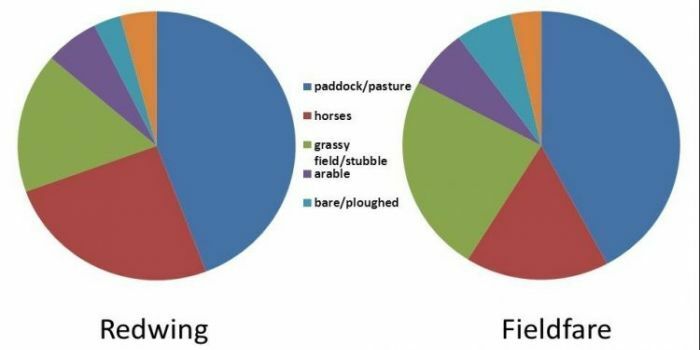 Where field types were mentioned for birds feeding on open ground, most records for both species mentioned paddocks or pasture, with surprisingly few birds on arable land. Redwings appeared to show a stronger affinity for horses (25% v 17%). Foods were difficult to determine for both species. 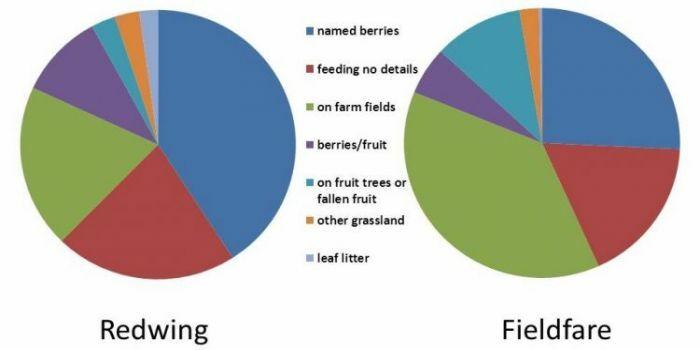 Berry species were recorded much more often for Redwings than for Fieldfares (41% v 26% for named beries). Fieldfares took food from farm fields much more often than Redwings did, although the food items they were taking could rarely be determined. Where winter thrushes were feeding on berries that the observer could identify, striking differences were apparent between Redwing and Fieldfare in their choice of food. 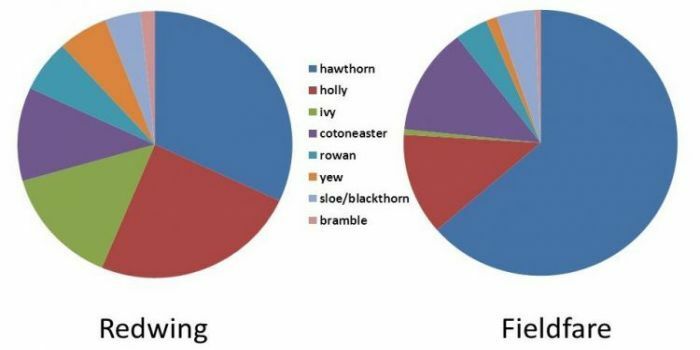 Hawthorn berries were most frequently named for both species but for Fieldfare this species accounted for 63% of all reports (32% for Redwing). The second most-named berry for Fieldfares was cotoneaster (13%). Redwings appeared to take a wider selection of berries and were seen feeding on holly, ivy, rowan and yew much more frequently than Fieldfares were. The survey launched on 12 September, prior to the main arrival of winter thrushes expected to begin by the end of the month. The survey is now open for observers to collect and submit data. Can you help with this?